Tiffany Kidd, the winner of the Reining Canada Beginner Class. Photo by Ian Maharaj. 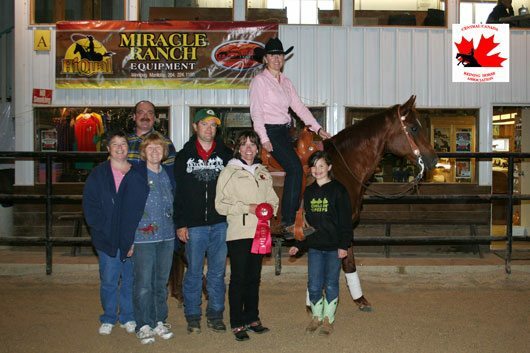 The Central Canada Reining Horse Association held its season opener at Miracle Ranch on May 29 and 30th. It was a weekend of Reining. Inside the building, the reiners were burning up the patterns; outside the rain was coming down in sheets. The weather was no match for us though and we had two days of great competition. While the thunder roared outside our door, the crowd roared as scores of 70 and above kept pouring in. Mother Nature tried her best to rattle our mounts but as the building shook from the thunder, our horses hardly batted an eye and kept their focus on doing their jobs. We started Saturday with a new class to the CCRHA. The Ladies and Men’s class that is open to all was a welcome warm up for many of the riders. Kylie Wasiuta and Smart Boom took home the first paycheck in that class. The Open went next with Kyle Shaw riding Sheena Patterson’s horse, Silver Rem It, laying down a 73.5 to take top spot. Tiffany Kidd riding Freckles By Hickory won the Reining Canada Beginner class. Congratulations Tiffany on your first win! 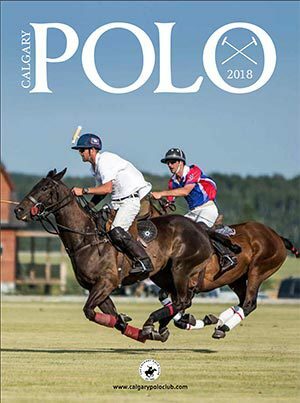 Micaela Maharaj and Fancy Footprint took the Youth 13 and Under, and Megan Robinson and Breanna Kid slid into the winner’s circle in the Youth 14 to 18. Another new class to the CCRHA is the Ranch Reining. 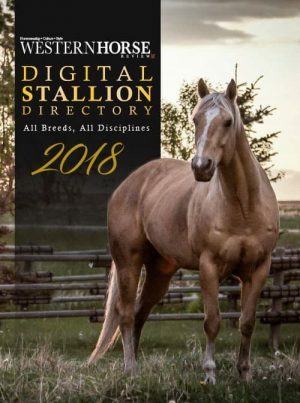 Congratulations to Austin Leposa and her gelding CW Lucky Sonny. Not only did this little girl have a very nice go but she also beat her Dad to take home the inaugural win in this class. After a fabulous lunch at the canteen provided by the CCRHA Youth Association and warm up time in the arena the Nonpro, Limited Nonpro and Primetime Nonpro were ready to go. Deanna Taras and Starkist Dunnit won the Nonpro and Limited Nonpro with a stellar 73! The Primetime Nonpro went to Bonna Jean Bateman riding Snazzy Whizard. This pair has seen a lot of the winner’s circle and it looks like the talent has carried on into 2010. The Rookie L2 was next to go. Kirstie Oswald steered her gelding, Chic Magnic, to the Red Ribbon with a nicely executed pattern. Kyle Ryan and Call Me Chexy won the NHNP L1. The boss instructed him that since their basement was flooded and she was home with a new baby he had better bring home a pay cheque!! Good thing you listened, Kyle. I suspect a nice dinner out or maybe some jewellery would help also to keep you in the good books. I will call her and let her know you said that would be ok. Next to go was the Young Rider Qualifying Class. Wow, did these girls throw down the gauntlet! 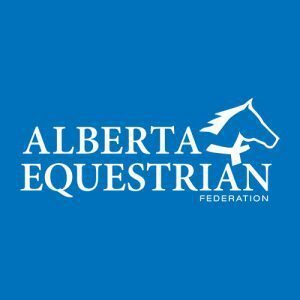 The caliber of these riders that are vying to represent Manitoba at the NAJYRC in Kentucky in July is phenomenal. Megan Robinson and Peppy Chic Olena came out on top the first day with a score of 72. All the girls did a fabulous job. The Green Rider / Green Horse rounded out the day. Saskia Madick and Doc Par Delucks won the Green Rider. Congratulations Saskia on a super run. Guy Robertson riding Hes A Gentleman Jac owned by Ron and Joanne Wytinck won the Green Horse. Sunday started out once again with the Ladies and Men’s class. Bonna Jean Bateman and Snazzy Whizard were the winners. The Open went to Guy Robertson riding Miles Snider’s horse, Blanc Chex to Cash. The RC Beginner was won by Carol Hollinger and CW Colored Rainbow. The Youth 13 and Under was won by Micaela Maharaj and Fancy Footprint followed by the Youth 14 to 18 and Christine Simpson and Pick Plays Rocketman, who earned the honors with a beautiful go and a 71 to show for it. 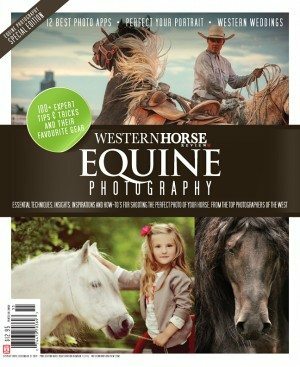 The Ranch Reining once again saw Austin Leposa and CW Lucky Sonny earning the red ribbon for her efforts. The Nonpro was a nail biter with Snazzy Whizard and Bonna Jean Bateman making the money. She also won the Primetime Nonpro. Hot on her heels was Megan Robinson and her mare, Breanna Kid, earning the win in the Ltd. Nonpro. The Rookie L2 once again saw Kirstie Oswald and her bay gelding, Chic Magnic, winning the plaque, with her Mom cheering on the sidelines. The Young Rider Medal Class was, once again, the class to watch. Kelsey Wiens and Poster Boy Solano Spun and slid their way to a 72.5 score. The team heading to Kentucky will be announced by Equine Canada soon. The Novice Horse Open saw Bonna Jean Bateman and her newcomer Inwhizable King working together to find the win. That made four wins for Bonna that day. What a cute horse! To end the weekend we saw CW Colored Rainbow and Carol Hollinger win the Green Rider. Lots of ribbons heading back to Saskatchewan. Congratulations on a great weekend for your family! Guy Robertson, riding Larysa Robertson’s horse, Nics Easter Bud, won the Green horse. Horse shows are hard enough to put on without issues like uncooperative weather to contend with but the ability of this club to make things go smoothly, from the members pitching in, to all our dedicated volunteers, makes it fun and relatively easy. All our volunteers have to be thanked throughout the season and the off-season for all the work they do. Thank you, also, to our NRHA Judge for the weekend, Mr. Shawn McClurg from Montana. It is always a pleasure to show for this gentleman. I hope his kids enjoyed their Canadian chocolate. 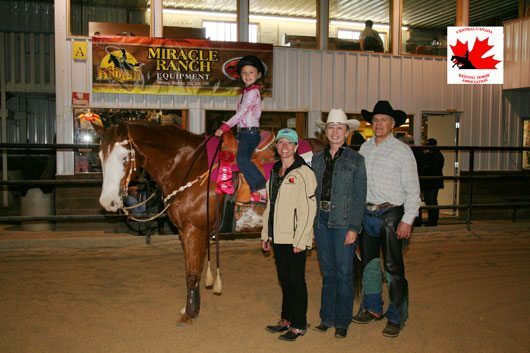 A special thank you to Phyllis and Keith Howe of Miracle Ranch for their sponsorship. The next show will be the Wheat City Derby June 19th and 20th in Brandon. Followed by the Rudko Summer Slide on August 14 and 15th. Good luck to Team Manitoba heading down to the North American Junior and Young Rider Championship in Kentucky in July. We will all be cheering for you.